The 1st Cavalry Division is one of the most decorated divisions of the US Army. 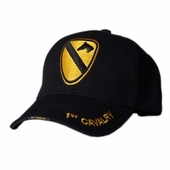 Support the United States Army with this high-quality embroidered 1st Cavalry logo cap. The velcro closure allows this cap to be one size fits most.